Last night was the opening night of A Year of Giving – the theatrical version of my year-long journey of giving $10 away every day to strangers while unemployed back in 2010. The nearly sold out show was a culmination of a lot of hard work. Melanie Papasian provided us with a terrific script. Pat Miller of Rockville Little Theatre produced the show and got the very talented Sasha Brätt to direct the production. We had some serious setbacks in the last two weeks….losing two actors to injuries (not related to the show…there’s no circus moves or acrobatics in the in the play – it is part of the Fringe Festival so you never know! ), but we managed to combine those two roles into one and find the amazing Devon DuPay who took on the daunting challenge of learning the entire piece in one week. You would never believe that she hadn’t seen the script before last week! In addition to her, Pat Miller and Steve Langley were phenomenal. 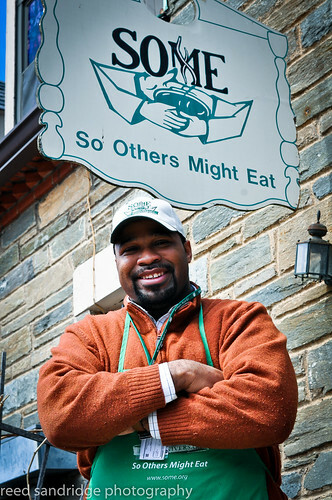 Miller shines as he portrays DC Central Kitchen founder Robert Egger who I gave my $10 to on Day 225. 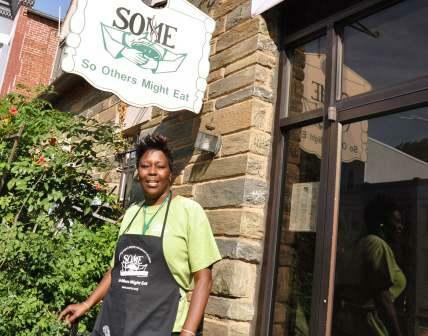 Langley did an amazing job portraying Ivory, a Street Sense vendor who I met on Day 49. 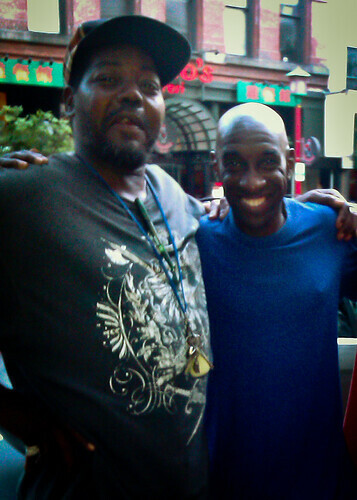 He also portrays Knox, my first $10 recipient, who by total coincidence was shinning shoes outside the theatre – a special treat for the audience and Langley who portrays Knox in the show. For me, seeing Knox outside was amazing. 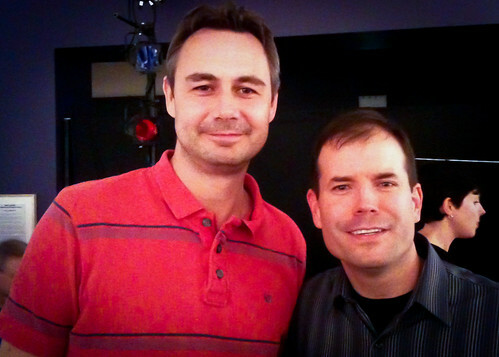 I’ve seen him a few times since our first encounter on December 15, 2010, but to run into him on the day that the show opened, that made my day! I’ve invited him to be my guest at any of the forthcoming shows….but it seems theatre is not his thing. He says he may try to show up and shine shoes outside the theatre though to make a few extra bucks. The other highlight was giving my $10 away to an audience member. Yep, you come see the show and you might just get ten bucks! Holger, originally from Germany, helps develop environmentally and financially sustainable transport solutions with the goal of improving the quality of life of city dwellers. He wasn’t sure what he was going to do with the $10 – but promised to follow up with me once he decided. All shows are at the Goethe Institut – a block from the Gallery Place / Chinatown Metro stop. For more information on the show, visit our Facebook Page. This post was supposed to be put up yesterday – sorry. I was out volunteering and got behind. 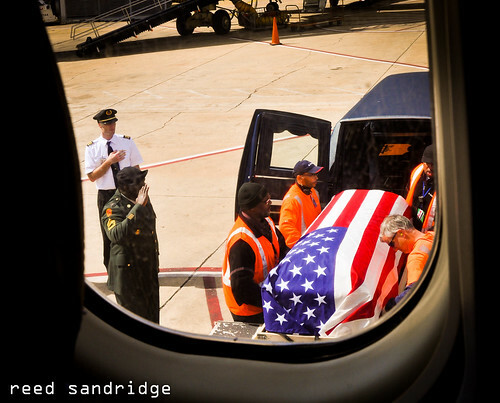 I captured this image of a fallen soldier being delivered to Arlington Cemetery on a recent return flight to DC. Yesterday was Memorial Day – a day when we remember those who have served our country. I took some time to think about my family members who have served – most recently my cousin Jonathan and his wife Alex. Thankfully they made it home safely. I then was reminded of Jen B. who I met on Day 362 of my Year of Giving. She lost her husband, Army 1st Lt. Todd J. Bryant, when his Humvee came under attack in Fallujah in October of 2003. My thoughts go out to her, Todd’s family and all of those who have lost loved ones serving their country. My first bike ride of the year is something that I look forward to every spring. The mixture of warm sunlight and cool air on my face as I roll by some of our country’s most iconic monuments keeps me sane. Washington is full of wonderful trails that provide safe riding throughout our nation’s capital. However there is one day each year that gives riders full access to the city and so many of the breathtaking vistas usually reserved only for snapshots out windows of slow moving cars. That day is Bike DC. I rode in Bike DC last year and even gave my $10 away to another rider. You can read the blog post and watch some video I shot while riding. This year I too was going to ride and then I got the idea that I would volunteer for them. I was stationed at the Will Call table which was set up on the corner of 3rd and Jefferson, directly west of the US Capitol. Technically I was supposed to be answering questions that the cyclists had, but there was a much greater need to actually check the nearly 4,000 riders in so I started checking them in too. It was impressive. We managed to process every single rider in about 90 minutes. The event, which costs riders about $35, supports the Washington Area Bicycle Association (WABA). They represent cyclists’ interest here in DC. I overlook their tired emails and letters because I, like many others here in the area, benefit from their work. Click here to find out how you can support WABA. After I was done working, I tacked on a rider’s bib and headed out on the course. It’s beautiful and there is something indescribable about riding through such a picturesque city with no cars. My favorite part though is crossing the bridge into Virginia and riding down the GW Parkway! That is pretty cool. I started this post off remembering those who have served in the military. In the theme of remembrance, I offer a name to you: Alice Swanson. She died just a block from my home while riding her bike to work in July of 2008. 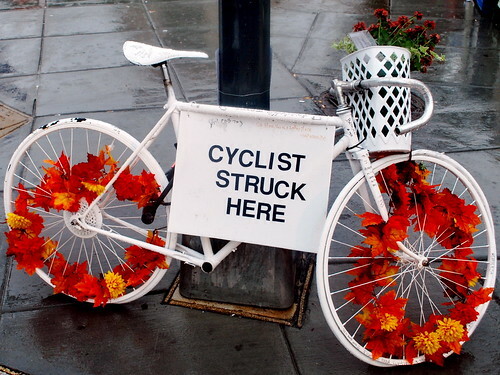 For a long time there was a white bicycle placed at the corner of Connecticut and R Streets as a memorial. Although I never knew Alice, there is not a day that goes by when I walk by that corner that I don’t think about her. Next Monday I will take you along on a volunteering journey with Yachad DC where we will rebuild some lower income housing near Fort Totten. 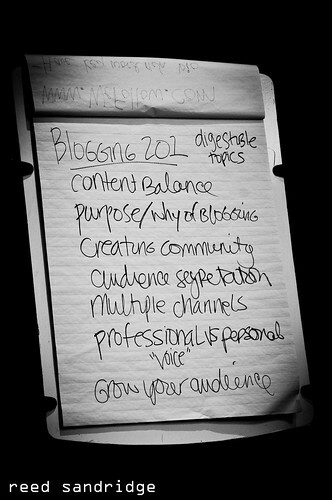 The Year of Giving transitioned from a blog to a social movement a few months into my year-long journey in 2010 and all of a sudden I was thrust into the space of social media. 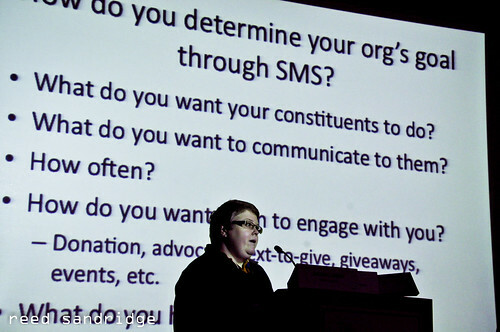 Given my background, I figured I would be a good volunteer for the DC Social Media Summit. I spent four years organizing and producing events and conferences in addition to my experience navigating the ever-changing field of social media. Sounds like a perfect match right? 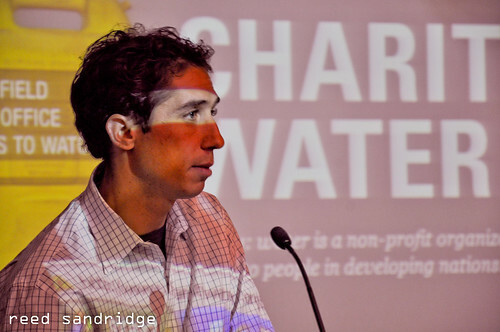 The event was produced by the Center for Nonprofit Success, a nonprofit registered under the name Mediate Facilitate Inc. This is the second time I have volunteered with this organization. The first time was back in Week 7. It’s an interesting organization. Part of me really loves the concept. They run conferences around theUS with no onsite staff. That’s right. Every single person working at the conference is a volunteer. That’s amazing! Despite the fact that I think our small team of volunteers managed to make the best of the situation we were presented with, it was not easy. We were missing guidance, information, tools, etc. Attendees seemed frustrated with our lack of information and less than organized demeanor. It got so bad at one point that some of the volunteers contemplated walking out during the middle of the conference. Thankfully the content of the sessions was quite good. The organizer managed to secure some really talented speakers who dazzled the couple hundred attendees. Although I did say that I was impressed that such an organization exists and puts on conferences all around the country with just volunteers staffing the events, I don’t think this is the best model. I believe there should be at least one employee at each event from start to finish to manage the conference. I think that would help in a variety of ways as well as help create the culture of the volunteer staff. I did some research on this organization. The math is just not adding up for me. For a nonprofit that has such a skeleton staff that onsite management is done completely by volunteers, I have to wonder where all their revenue goes? There were no handouts to give to attendees – they were asked to print them themselves along with their name badges. The speakers were also donating their time and not compensated for their appearance or travel expenses. So I was left with more questions than answers. I did get to meet some interesting people who were volunteering with me and got to see a few minutes of one of the presentations which I found very interesting. Having said that, I don’t think I will volunteer with this organization again. Click here to see more of the photographs that I took during the event. Year of Giving volunteer getting dirty! 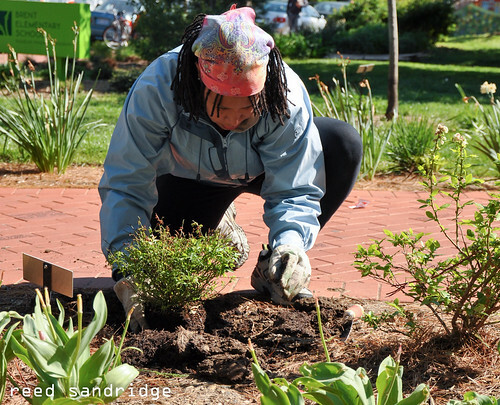 If you live in DC and are not familiar with Hands on DC, check them out today! 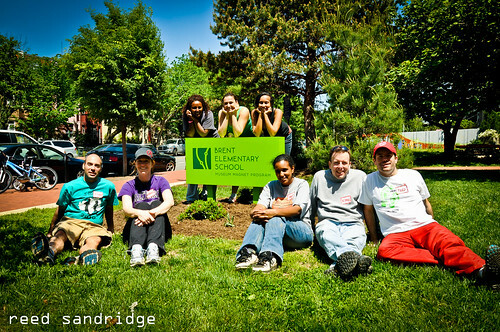 Founded back in 1994 by a small group of friends who wanted to make a difference in DC public schools, this all-volunteer organization leads a variety of improvement projects at more than 30 area schools. Their largest event is Work-a-Thon, held every spring. 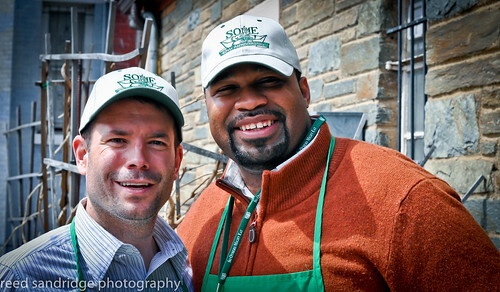 I signed up to lead a team at the 2011 Work-a-Thon that was held April 29th. I was joined by about a dozen Year of Giving volunteers. We were part of a larger team that was assigned to Brent Elementary School, a Pre-K – 5th grade school located not even three blocks from the well-groomed lawn of the US Capitol. But I was indeed in the right spot. This school, which seems to be very progressive with their Museum Magnet Program, benefits from the fact that the staff and parents are very involved with all aspects of the school experience. To give you an idea, check out something I found on their website: “Students, parents community members and Brent staff will collaboratively share leadership and accountability for empowering the highest quality of teaching and learning, everyday, in every Brent setting, for every student.” We worked side by side several parents and staff members and I could tell that they really cared for their school. Team Year of Giving quickly got to work on a variety of projects. I, like most of us, spent the day weeding and mulching. My brother and Jody planted a tree. Kimon and Aster built a tee-pee! So there were some interesting projects. Everyone on the team had a great time. I hope to do more volunteer projects where I have support from you guys! Thanks to those who came out and helped make Brent Elementary look really fantastic! Click here for more photos. For those of you who were not able to participate in Work-a-Thon can make a donation to this great organization. 100% of your donation will be to secure supplies for service projects as well as to provide college scholarships through College Bound, a local mentoring and tutoring organization dedicated to supporting DC public schools students who want to attend college. We are one month away from the Worldwide Day of Giving – if you haven’t signed up, and everyone can sign up, click here. How many people do you think we can get to sign up in 30 days?! The above quote is particularly relevant to today’s post. As you know every Monday I bring you a blog post of my weekly volunteer activities. Today’s service project was one that I took part in along with more than 8,000 other volunteers throughout our nation’s capital. 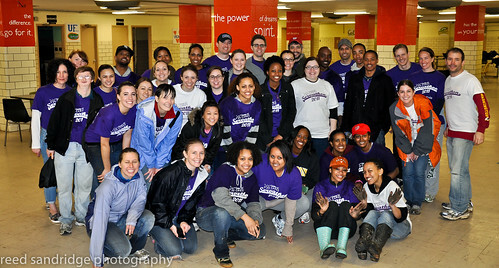 For the past 18 years, Greater DC Cares has organized Servathon – two extraordinary days of service. The first day corporations and their employees participate in region-wide projects that focus on schools, parks, and other community areas. On the second day, individual volunteers join in. 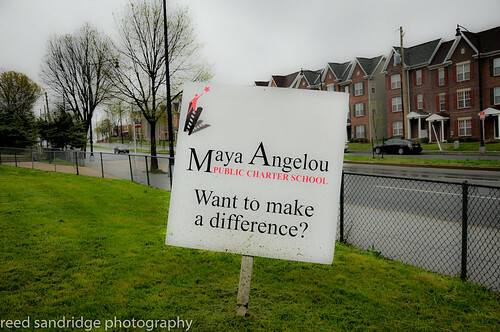 I registered a Year of Giving team for the second day where we were tasked with working on several outdoor projects at the Maya Angelou Evans Campus here in DC – a charter school in Northeast. As I drove up to the school on Saturday morning colorless skies grew heavy and rain began to fall upon my windshield. I was hoping the rain would hold off until we finished our outdoor projects. We were building a garden area; from constructing the wooden frame that would encompass the area to building benches and painting concrete slabs that would be used as a walkway. I was in charge of building some of the benches which turned out not to be to be too difficult since all the wood came pre-cut. Thankfully we could do this work indoors, but that wasn’t the case though for several other teams who spent hours in the rain. Mud was everywhere. The beautiful thing about working on these projects together is that despite the thick layer of wet earth that was slathered on our clothes and exposed skin, spirits were bright, friendships were forged and cooperation thrived. Thanks to all of those who came out to support team Year of Giving! Click here to see more photos from the day. 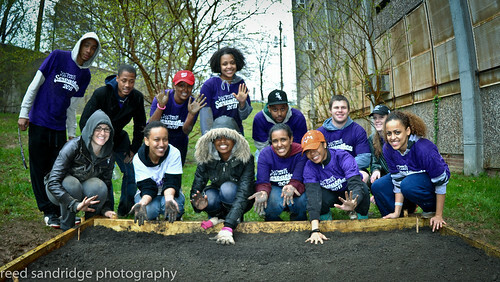 Check out the Greater DC Cares website for other volunteer opportunities such as Servathon. Their next region-wide service day will be held on 9/11, but you can find hundreds of other volunteer opportunities throughout the year on their website. DC Cares also holds an annual event called IMPACT Summit which focuses on volunteerism, service and philanthropy. As part of the event, they present a series of awards to outstanding organizations and community leaders who demonstrate extraordinary leadership in volunteering. If you know of any organization or individual who should be recognized, please click here to nominate them. Enjoy your week…hopefully we will have a new kindness investor soon!